The learning-curve rises quickly. Once or twice to-and-fro on the terrace, and I was already maneuvering without fear around curves and through tight spaces. The engine-noise is pleasantly soft, especially when travelling slowly, and hardly disturbing. My travels in the first week lead me to the local tax office (to deliver my tax-estimate), to JessenLenz, Inc. (discussion with Jürgen Lenz), to cbb Software, Inc. (deliver circuit-boards) and to the JABIS engineering company. In the meantime I'm riding with the red key (which allows the highest speed and the smallest curve-radius) and I feel perfectly safe. No unpleasant surprises. Riding is fun, and the toy fulfills what it promised. For observers this means of transport is on the whole new, they are astounded and dumbfounded, but generally react positively. Many think that I am handicapped. ("What mobility ailment must one actually have to get that prescribed?") A passer-by stops me and starts asking completely to-the-point and very expert questions. 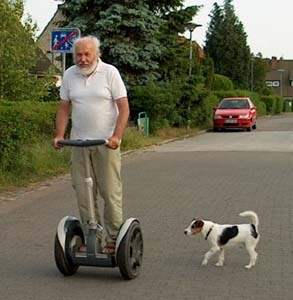 He knew the Segway-story and the website of Phillip Torrone (in the meantime unfortunately no longer available). After I let him ride a short distance, he wrote me by e-mail: "That I was impressed with the idea, I had indeed already said. Now that one can try it out in practice, I am totally enthusiastic." I still ride very gladly and almost daily. 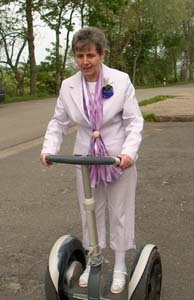 Riding a bicycle is perhaps more healthy, but when it comes to riding-fun, manoeuvrability, and taking-up-space the Segway HT is without peer. 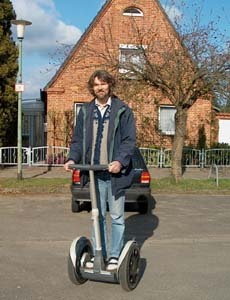 When it isn't raining I do all errands, visits, and message-deliveries within Lübeck now only with the Segway HT. Most of these trips I travelled earlier by car, not by bicycle! 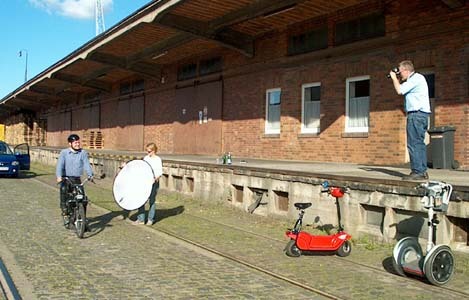 Children and young people learn to ride the fastest. Jella rides completely safely and also has mastered getting off and on when dealing with stairs and curbs. She already complains that she is still only allowed to ride under supervision and with the black key (little straight- and turning-speed). But after her school-friend bungled a braking-maneuver and jumped off the machine while it was going, tripped and fell but also kept holding on to the handlebars, so that the heavy wheels (38 kg) came back and collided with him again, it was clear that this is no sort of danger-free child's toy. But there were no wounds, her friend only came away somewhat scared. 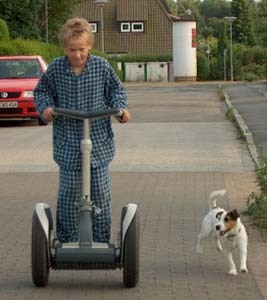 The self-balancing feature indeed gives the Segway HT a great degree of built-in safety, but on uneven or slippery ground one can still stumble with the wheels, slip or tip over like with any other vehicle or even when travelling on foot. The safety-video emphatically warns against these dangers. The wheels have practically grown onto my feet. I glide from destination to destination practically automatically. No problems, accidents, or significant misadventures. I hardly encounter negative criticism, only a patrol car team in a bad mood ("You're only allowed to use that at home, in your own garden.") almost exercised their right of confiscation. But they finally let things go with a pair of general admonitions, and I was allowed to proceed on and continue to delight friends and strangers with test-rides. One thing happened again and again: After the initial insecurity was overcome, almost all pilots begin to display a very special smile, the "Segway smile." The riding-pleasure continues uninterrupted. The general interest for the vehicle as well. In the meantime three teams of journalists came by, to report on the new vehicle. The TV report by Mick Locher, broadcast on N24 and Sat1, you can get here for Windows Media Player, either for DSL bandwidth (14MB) or for ISDN bandwith (2 MB, but naturally of rather poor quality).